Last year I took over the Ocean Friendly Gardens Program Coordinator position with the Cape Fear Surfrider Chapter (in North Carolina). In 2014, the Chapter had participated in building a huge OFG at a shopping center (blog post here), which I was not a part of. 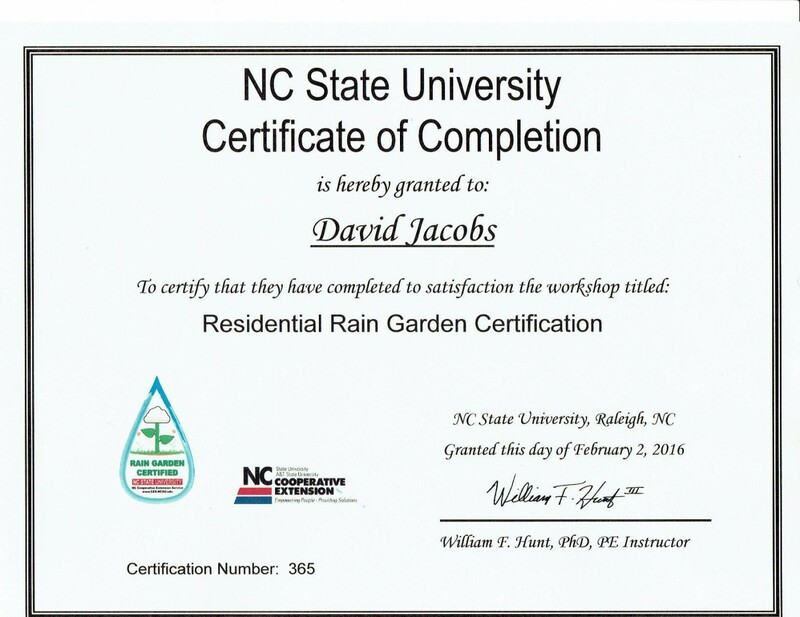 To help deepen my knowledge base, I took a two day seminar on Residential Rain Garden construction and maintenance, given by the North Carolina State Cooperative Extension and North Carolina State University Bio & Ag Engineerng Departments. While it is primarliy geared for professional landscapers and stormwater management folk, it's definitely understandable by OFG'ers. I passed the class and was given a certificate (at right). It has taught me how to design and build rain gardens, using native plants and taking into account our unique climate and hydrology (here that means hot, humid and rainy, with primarily sandy soils). A big part of the test was successfully designing a rain garden in a commercial setting. We also constructed a rain garden at a home, which is part of a development that is under a mandate to reduce runoff (the original developers overbuilt all of the lots). We were literally digging, laying the mulch, diverting downspouts, planting native species, etc. It was pretty fun, and we were able to sponge up 1500 sq ft of runoff from the roof and driveway. This course really helped me understand the practical nature of these projects and has allowed our Surfrider chapter to become more confident with doing hands-on projects. 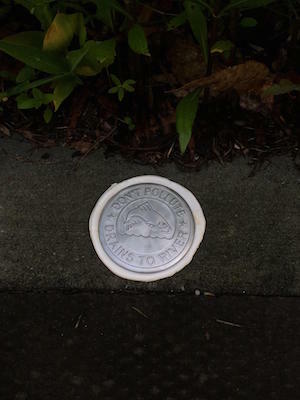 In June, Geoff and Jennifer asked Surfrider to participate in a storm drain marking project in the City of Wilmington (the marker is pictured below). It was, again, working with the City's stormwater management folks and was a really nice event. 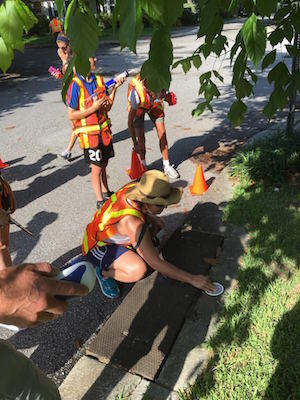 We cleaned out storm drains, took notes on the debris in the drains, then marked each drain with plaques reminding people that all of the water flowed into our rivers etc. Anyway, back to the presentations. 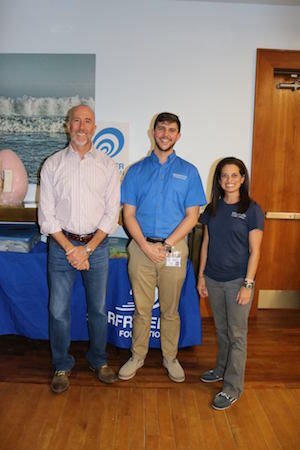 Cape Fear Surfrider Chapter Chair, Ethan Crouch, and I presented an OFG seminar at Dolphin Bay community clubhouse to approximately 15-20 homeowners. 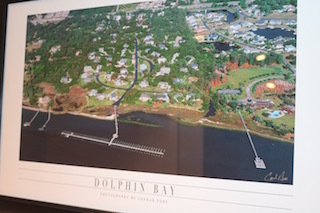 Most were from Dolphin Bay, which has pretty persistent flooding issues, and a few were from the local area (see map, below). 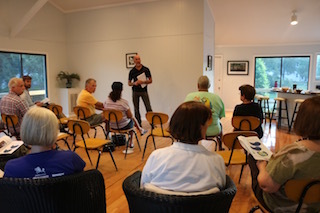 The presentation consisted of basic facts regarding storm water runoff, and presented OFGs and rain barrels as ways to help clean our water and save money on watering. We distributed fairly detailed pamphlets showing how to build an OFG; where to locate, depth, size, along with a list of native plants suitable for planting in an OFG; and various resources to help people begin their projects. These resources include our OFG brochures and links to state and local agencies (for example, our Soil and Water Conservation District, Heal our Waterways and the City of Wilmington's best management practices for stormwater). The question-and-answer period got the audience talking among themselves creating their own micro networks, planning together about how to make use of storm water. This shows the need for OFG presentations, given that at the beginning, the attendees did not understand much at all about storm water and non-point source pollution. We have gotten started on our next endeavor, which is agreeing to set up rain barrels and help with stormwater management at Dreams of Wilmington, a non-profit, after-school facility catering to under-privileged kids. Currently, they have downspouts draining onto concrete and are having trouble watering their gardens. I recently spent a couple of hours there, designing a stormwater managemnet plan to include rain barrels, gutters and eventually an OFG. For now, Cape Fear Surfrider will buy and set up rain barrels on raised platforms at the Dreams site so they can irrigate their gardens. We are looking into underwriting some gutters along the front of their building and diverting the downspout into another rain barrel. Additionally, we are going to hit up the local surf shops and surf camps for old boards to donate to the center. They LOVE going to the beach and being able to play around on boards.